LONDON — Kimiko Date-Krumm remembers the good ol’ days, when she used to shop in the morning, then go play tennis at night. Those days are over — at least the shopping part. At 42 years young, Date-Krumm is still out there, leading the way in what is turning into quite a renaissance for the aging set this tennis season, and at Wimbledon this week. “When I was young, even during the tournament, I had energy for the shopping, but now I have no energy for that,” Date-Krumm said Saturday, shortly after she became the oldest woman to play a third-round match at Wimbledon in the 45-year Open era. 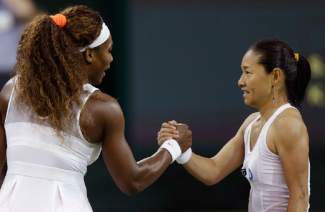 She fell 6-2, 6-0 to the tournament’s top thirty-something, Serena Williams. As of this week, the average age of the top 20 players on the men’s tour is 27 years, 260 days — more than 2½ years older than it was 10 years ago, according to STATS Inc. And on the women’s tour over the last 10 years, the average age has spiked by almost exactly two years — to 26 years, 213 days. Players such as 31-year-old Li Na, 31-year-old Mikhail Youzhny, 31-year-old David Ferrer and 35-year-old Tommy Haas — all of them preparing for Monday matches at Wimbledon — contribute to those numbers. Haas advanced by defeating 31-year-old Feliciano Lopez in four sets. “There’s no doubt that a certain type of training and proper practice and maybe even diet, all put together, can help someone stick around for a while,” said Corrado Barazzutti, a top-10 player in the 1970s who coached Francesca Schiavone when she won the 2010 French Open. Schiavone was less than a month shy of 30 when she took the title in Paris, making her the oldest woman since 1969 to win her first Grand Slam championship. All of this feels like a different world to Pat Cash, the 1987 Wimbledon champion, who played in the days when the sight of, say, a 37-year-old Ilie Nastase or a 39-year-old Jimmy Connors prowling the court wasn’t unheard of but certainly wasn’t as common as it is now. Rules that restricted the number of tournaments teenagers could play actually date to the 1990s when tours, especially the women, saw an increasing number of teens — Jennifer Capriati, Andrea Jaeger, Martina Hingis — enjoying early success, but finding themselves unable to cope with the physical and emotional strain of getting so good, so fast. Tracy Austin won the U.S. Open at 16 and was all but done by 21. She said the age restriction certainly helps push the average age up, but concedes there must be other reasons for the recent spike. The demise of serve-and-volley, along with advances in equipment have gradually turned tennis into a slugger’s affair and helped raise the level of fitness required in the sport. The grinding nature of today’s tennis has, in many ways, created more injuries, but also put an emphasis on finding more ways to prevent and heal them. Williams is Exhibit A on how to extend a career, though she hardly took a traditional route. Different interests and injuries dictated she miss large chunks of time over the years, which might explain how she is feeling fresh and dominating — the oldest woman to reach No. 1, at age 31. But, she concedes, she doesn’t feel the same as when she was 21. All this talk about the aged, of course, isn’t to say that youth isn’t being served in tennis. At Wimbledon, Saturday wasn’t all that bad a day to be young. Australia’s 20-year-old Bernard Tomic won a four-setter against 27-year-old Richard Gasquet of France. On the women’s side, Britain’s 19-year-old Laura Robson won her third-round match over 25-year-old Marina Erakovic to advance to the second week, and 20-year-old Sloane Stephens of the United States beat 28-year-old Petra Cetkovska. “I’m going to be playing for like another 10 years, so, you know, it’s all bonuses for now,” Robson said. By then, it figures Haas will be out of the sport. He certainly isn’t going quietly, though. Oft-injured, oft-recovered, he has risen to 13th in the world on the strength of eight appearances in quarterfinals or better in tournaments this year. At Roland Garros, he became the oldest man since 1971 to reach the quarterfinals, where he fell to Novak Djokovic. On Monday, in the fourth round of Wimbledon, he’ll have a rematch and will try to become the oldest Wimbledon quarterfinalist since 1979. “He’s playing his best tennis ever, feeling so great. So fit,” Djokovic said. Haas simply rolls his eyes whenever he’s asked about his age. Or his injuries. When someone’s been around as long as he has, everything hurts. AP Tennis Writer Howard Fendrich and AP freelancer Sandra Harwitt contributed to this report.